Founded in 1985 has morn than 27 years of experience, PIN YING is a leading provider in developping and manufacturing of plastic extruder included downstream machinery for profiles and pipes. And today, we are striving harder that for service of customers’demands. During long time experience, PIN YING are also dedicated to offer high level of productivity and perfomance with continuous innovations. 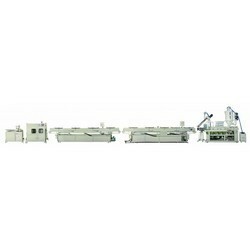 Moreover, PIN YING was the pioneer in the field of modem conception of extrusion downstream machines. Customers'specifications by our high flexibility of the own developping, should you need our help for special problem, we are the ones for your best choice. Please contact us for more information.